Ocean acidification in the water off the coast of British Columbia is killing millions of scallops, putting the industry in danger, according to Vancouver Island University’s Helen Gurney-Smith. She says it’s actually a global problem, but it seems to be worst off the coast of British Columbia. She told the CBC: “It could be that some species are better adapted to ocean acidification.” Scallops in particular are vulnerable, because the acidity in the water makes them unable to form a protective shell, leaving them vulnerable to bacterial infections and predators. Oysters fare only slightly better. 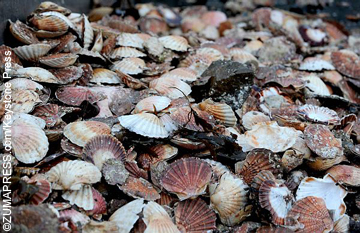 Gurney-Smith is urging for more research to help keep the shellfish industry afloat. Twenty people, or one-third of workers at Island Scallops in Parkland, B.C., are being laid off because 10 million scallops have died since 2009 before they could be harvested. “[The water is] much more acidic than we expected,” Rob Saunders, CEO of Island Scallops told Global News. Scientists say normal PH levels in the water are 8.2, but the levels have dropped as low as 7.2. “We’ve lost pretty much all the 010 year class, all the 011 year class, which was our big year class, we couldn’t keep anything alive through 012,” said Saunders. This entry was posted on Thursday, February 27th, 2014 at 12:20 pm	and is filed under news. You can follow any responses to this entry through the RSS 2.0 feed. You can leave a response, or trackback from your own site.